Amidst all the excitement surrounding Rogue One: A Star Wars Story we've been getting some interesting casting news regarding the upcoming Han Solo stand alone film. Yesterday The Wrap reported that the production is currently casting a young Lando Calrissian to appear alongside side Alden Ehrenreich as Han Solo. Now Devin Faraci from Birth. Movies. Death. has added something else to this rumor. In addition to corroborating The Wrap's report, he claims to have heard that Donald Glover is the "first choice" to play young Lando. Glover is perhaps best know for his role in the TV series Community, as well as movies such as The Martian and the upcoming Spider-man: Homecoming film from Marvel. Faraci admits he's unsure if Glover has been offered the part and whether or not the actor will even take it if given the opportunity. If directors Chris Miller and Phill Lord really do want Glover, hopefully they can get him. Of course, despite all this coming from reliable sources, we have to label this as a rumor until it's officially confirmed. 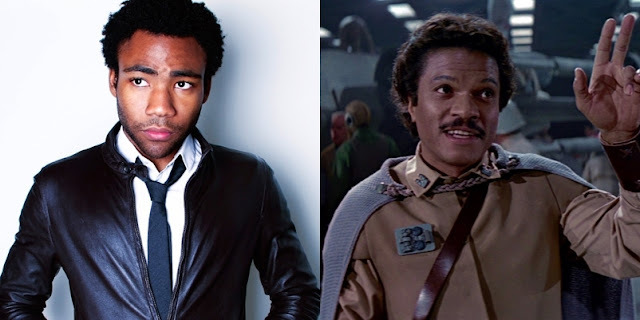 So, do you think Donald Glover would be the right actor to play a young Lando if he does appear in the Hanthology film? Let us know your thoughts in the comments below! Yes, yes, yes!!!! He would be perfect.